Product Description - Peperami Fire Stick - 24 x 22.5gThe great taste of peperami salami is no a.. Product Description The great taste of peperami salami is no accident. It is made to specia.. 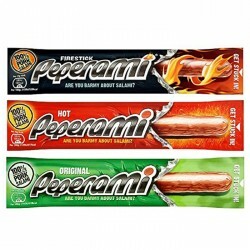 Product Description - Peperami Hot - 24 x 22.5gThe great taste of peperami salami is no accident..